Ngarla people today announced a heritage and mining agreement with the Boral Group of Companies regarding the Tabba Tabba rock quarry, approximately 40kms east of Port Hedland. The agreement addresses mining practices over the ‘Mikurrnya’ Aboriginal site, near the quarry, which is of mythological importance to the Ngarla People. In order to preserve and protect the Mikurrnya site to the greatest practical extent, the parties agreed to a final footprint for the mining operations, along with Exclusion Zones to protect the rest of the site. The agreement also includes compensation to the Ngarla People for impact on their country and formal recognition that past operations had disturbed the Mikurrnya site, causing distress to the Ngarla People. 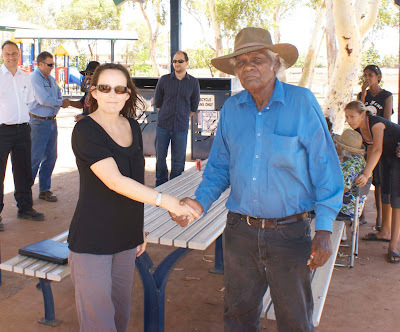 Ngarla Elder, Charlie Coppin said, “Mikurrnya is one of our most important places. It’s always been there – since the beginning of time. We need to look after it. We were very upset that the quarry was put there. Now we’ve got an agreement to try and protect it. Ngarla Country covers approximately 4,655 sq km of land east of Port Hedland. The Ngarla People were recognised as native title holders over the area in 2007 and have now have non-exclusive native title rights including the right to enter and remain on land, camp, hunt, fish, gather and use resources of the land and waters (excluding minerals), engage in rituals and ceremonies and protect areas of cultural significance. As native title holders, Ngarla people must be consulted about development on their land and have a right to negotiate over mineral exploration and the development of new mines. Ngarla people have a native title claim over the area of Mikurrnya.